AlunaGeorge, the London-based duo featuring singer/lyricist Aluna Francis and producer George Reid, has come to the states for a slew of dates. Once those wrap up, the band will join Sia on her Nostalgic For The Present arena tour, which kicks off on September 29. The group’s forthcoming sophomore album, I Remember, features the catchy single, “Mean What I Mean,” which features guests Leikeli 47 and Dreezy. 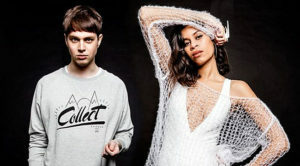 “Mean What I Mean” premiered as Annie Mac’s ‘Hottest Record In The World’ on BBC Radio One in the UK. We spoke to Francis via phone from a Toronto tour stop. You and George first met in 2009. What were the circumstances? It was back in the day when Myspace was this amazing thing for friends and musicians to communicate and connect. George did a remix for my old band that I was in at the time and then we decided to meet up in real life at, I say in the studio, but it was really just George’s bedroom. Do you both like the same kind of music? I think we do in some ways. He likes Radiohead and from there, he goes into soul, Motown and funk. I like soul as well, but I like PJ Harvey and Jeff Buckley and guitar bands. In that way, I’m different from George. Do you feel like you’re part of the EDM world of DJs and electronic musicians? It’s kind of weird for us. We don’t fit directly into genres but we have some part of our sound that fits into that category. We’re often on the EDM stage. It’s a tough kind of world to be in when you’re singing songs from the heart. Talk about making the new album I Remember. How did you end up splitting time between L.A. and London? We get inspired by different environments so we switched it up and worked in the countryside at a residential studio in Henley to come up with songs like “Mediator.” The last things we put out were written in London. They’re all quite different. They have our sound because of how we work. It takes you through a journey of different vibes or mood but I think the songs all tie together. I think the music is sonically much richer on this album. It’s not that I can really elaborate on what you said. As musicians, we’re dedicated to developing our skills. One of the things we really enjoy about the artists we love is listening to them develop and seeing how they grow as artists. We’re just trying to do the same thing. “My Blood” has such an eerie vibe to it. Did something in particular inspire it? That song lyrically is touching upon some social issues. It’s more relevant now considering the climate of what’s going on at the moment. Those issues have always been going on. I am talking how to take the fight in a way where we realize there is always someone — a small number of people in this world but I don’t know who they are — benefiting from the rest of us fighting and hating each other. My question in that is an invented scenario. It’s like, what if people stopped for a second when we asked them if they’d like to come and join us on the front lines? They probably wouldn’t. But would that have effect on how motivated we are to fight and murder each other, or would we think of something else? Tell me about the production on the tune. I was working with Flume and he had a track he was playing me. It was pretty fast. I asked him to half time it. I asked him to take quite a lot of the extra elements out of it. We got back to what we hear on the song which is a stripped back, pretty slow thing. It really came to life when we did that. “Mean What I Mean” is such a fun track. But it has a serious message doesn’t it? That song was inspired by a real scenario. One of the things that I’ve noticed is that if you add something funny, light or positive to a serious thought it becomes more powerful, at least in difficult situations. Instead of being angry, I wanted to be more playful. I play on the word “mean” to get that message out there. You feel stronger when you feel positive. If I was in a difficult situation again, I would want to deal with it. My way of dealing with it would be to feel like I could come into that situation and laugh at the things I don’t like and then move on. If someone is being mean or whiny to me, I totally know how to deal with that situation and I still feel good. I still feel good. Were you and Leikeli47 and Dreezy, who have cameos on the track, all in the studio for the recording? George and I finished it with nobody on it. It was almost hitting the spot. I had this image in my head where I needed some more support from my girls. In the industry at the moment, I feel like maybe we’re not seeing as many girls back each other and collaborate together. It’s more common when girls and guys or guys and guys collaborate. I thought we should encourage each other. Katy Perry was one of the first female artists to really support me in what I was doing by taking me on tour and giving me advice. She recommended me to other people. I realize I need to do that more myself. The two girls on the song really supported me and made it what it is now. We work pretty hard on making a hybrid between what you hear on the record and a live band experience. I have two musicians who work with me and have worked with me since almost day one. We just have fun on stage. We can make mistakes. Not everything is regimented. We do a lot of preproduction to make sure we get the rich sound you hear on the record. It’s tailor-made for a live situation because it’s really different. You must be excited about the upcoming tour with Sia. Yes. I think it’s an incredible opportunity to be on the stage with people who are interested in lyrical content and making classic songs that people connect to and think of as reflecting a specific period of time.